Plays, data maps, video projects, and book reviews from Asymptote's team of editors and contributors! Remember Isle-to-Isle? Chief executive assistant Berny Tan and Sher Chew’s collaborative data visualization and experimental reading project based on Jules Verne’s The Mysterious Island? (Now say that three times fast!). Well, the yearlong project is going strong, and the two collaborators reflected on their first five weeks with Mr. Verne in the Parsons Journal for Information Mapping. In this fascinating read, they delve into the trials of imagining the novel in map and diagram form. For all you D.C. and Austin theatergoers: drama editor Caridad Svich’s Spark will receive its world premiere at theTheater Alliance, Anacostia Playhouse, on September 4–28, 2014, in Washington, D.C., under Colin Hovde’s direction. Likewise, her play Guapa will be produced at the Austin Community College-Rio Grande Campus on September 25–October 5, 2014 in Austin, TX, under Tomas Salas’s direction. Past contributor Jeremy Tiang translated Floating Bones, a double bill of translated plays by Quah Sy Ren and Han Lao Da that was performed at The Arts House, Singapore, in July. Playwright Han Lao Da’s work appeared in Asymptote in April 2011, and offers a glimpse of a dystopian Singapore in which the aging population has been placed in pods and left to drift at sea (things end well… right?). Tiang is also the author of The Last Days of Limehouse, which was also just performed by London’s Yellow Earth Theatre and depicts London’s now-gone Chinatown. Past contributor, translator, and writer John Taylor reviewed Gellu Naum’s Athanor & Other Poems, translated by our new Romanian editor-at-large MARGENTO and past contributor Martin Woodside for the The Arts Fuse. Taylor writes of Naum, a prominent Romanian surrealist poet, that he uses the “heterogeneous juxtapositions of surrealism” to craft a “symbolic order that draws on autobiographical material,” and he praises MARGENTO’s introduction. 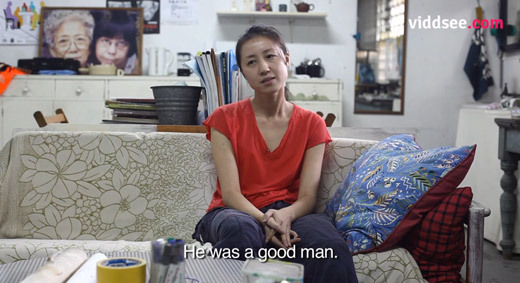 Guest artist for Asymptote’s July 2011 issue Sherman Ong launched a series of video confessions in which urban dwellers speak about their lives and futures. Motherland deals with the migration of people, and portrays a different Singapore, as seen, in one case, through the eyes of Xiao Jing (pictured above), a mainland Chinese woman who comes to Singapore to find a better life (and maybe love, too). The project won a prize at Videobrasil recently. Prizes, prizes, and more prizes! We’re thrilled to congratulate past Asymptote contributors who were awarded NEA Literary Translation Fellowships for their phenomenal work. These are Alexander Cigale, Jennifer Croft, Andrew Zawacki, Katherine M. Hedeen, Jacquelyn Pope, and panelist at our New York event earlier this year, Jeffrey Yang. And a warm congratulations to contributing editor Adrian West, who won an English PEN award for translation, as well as our past contributors who also took home this prize, Nicky Harman, Susan Bernofsky, Daniel Hahn, Elisabeth Jaquette, Sinophone “20 under 40” inductee A Yi, and Asymptote friend Anna Holmwood. Finally: among the recently unveiled PEN/Heim Translation Fund winners, two are from our midst! Assistant managing editor Eric M. B. Becker won for his translation of Selected Stories by Mozambican Mia Couto, winner of the Prémio Camões and the 2014 Neustadt Prize; in addition, contributing editor Sayuri Okamoto won for Dear Monster: the Naked Poetry of Gozo Yoshimasu. Also to be congratulated are Asymptote alums Benjamin Paloff (who won for The Game for Real by Richard Weiner) as well as Philip Metres and Dimitri Psurtsev, who co-translated Arseny Tarkovsky’s I Burn at the Feast. A round of applause to all!